We understand that you have a army of relatives visiting you this year and you need fun, but inexpensive, party supplies. These $1 items are designed to give you the holiday flair you want without breaking the bank. 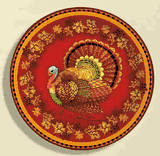 You can choose from a wide variety of Thanksgiving napkins, Thanksgiving plates and more. Thanksgiving Plentiful Harvest Cornucopia Lunch Napkins 16ct. Autumn Offering Thanksgiving Lunch Napkins 16ct. Bountiful Harvest Lunch Napkins 16 Ct.
Bountiful Harvest beverage Napkins 16 Ct.
Floral Inspiration 9oz. Hot / Cold Paper Cups, 8ct. Autumn Sampler 7" Square Thanksgiving Cake Plates 8ct. Autumn Sampler Thanksgiving Beverage Napkins 16ct. Autumn Sampler Thanksgiving 9oz. Hot / Cold Paper Cups 8ct.